Bose Improves Collaboration and Strengthens Partner Networks - E2open | Demand. Supply. Delivered. 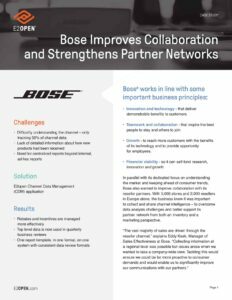 With the vast majority of Bose’s sales driven through the reseller channel, the company was looking to improve collaboration with its partners and better understand the channel. In this case study, learn why Bose chose E2open Channel Data Management and how they are now able to more effectively manage incentives and rebates.